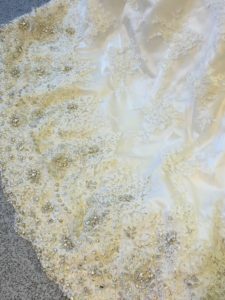 WHY IT IS ALMOST IMPOSSIBLE TO GIVE REALISTIC ESTIMATES FOR BRIDAL ALTERATION COSTS OVER THE PHONE WITHOUT HAVING SEEN THE GARMENT. ONLINE wedding dress shopping: This dress was ordered and bought online. Sizing abroad can often differ from UK sizing. On arrival it turned out to be two sizes too big for the bride. A UK alteration like this can be more expensive than the overseas cost of the dress, because in this case the dress needs full re-tailoring. This online wedding dress may have looked good value at first sight, but sight-unseen overseas buying can sometimes can backfire and cost a whole lot more to fit than to buy. 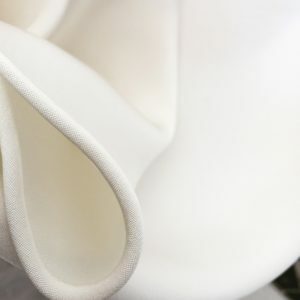 We are often asked to estimate wedding dress alterations – over the phone – but giving an ‘unseen’ quotation for an alteration is not always as easy and straightforward as our clients would like it to be. In order for our clients to gain a better understanding of the alteration process, the time it takes and the pricing, we are initiating a series of Blog posts explaining why even some of the most common dress alterations, like shortening or taking in side seams, differ. Various factors come into play – like haute-couture dress styles, multiple-layers, linings, and differences in garment construction, including corsets and additional embellishments, can add considerably to time and cost. This is not necessarily because the alteration is more difficult, sometimes it is just more time consuming. Letting out dresses is usually much more expensive then reducing them. When brides get in touch with us to enquire, they frequently offer simple descriptions like: “My wedding dress only needs lifting a few centimetres” or “perhaps the straps just need to be shortened” or “It does not need much doing – just a few tweaks”. To start, the series, let’s discuss what’s involved in shortening a wedding dress. 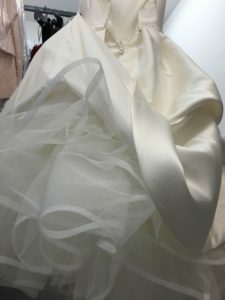 Shortening a wedding dress can be a straightforward, as long as a dress has one layer finished off by a machine stitch. 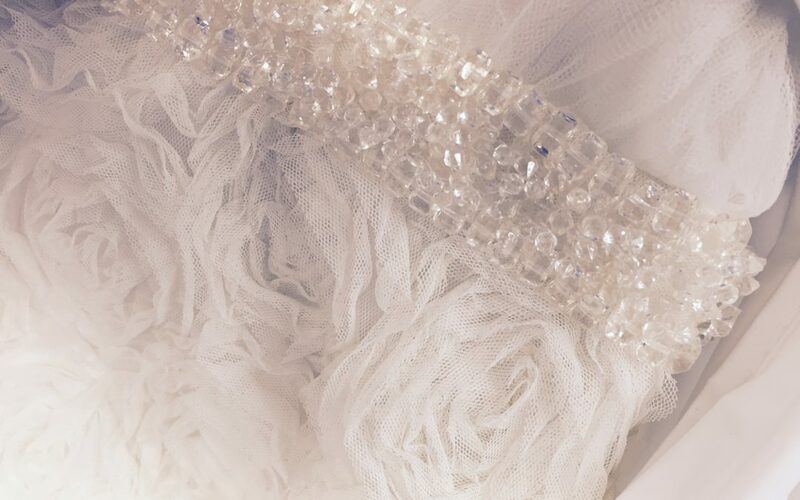 Most bridal garments move gracefully because they are designed using multiple layers of alternating fabrics like silk chiffon, satin, tulle and silk crepe. Shortening each layer, carefully and individually, becomes a much more time-consuming exercise. Additionally, some bridal designers establish an individual distinctive style. For example, a haute couture finish will result in all layers being finished by hand, not machine. 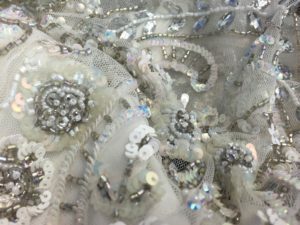 In order to maintain the original dress features, like hand finishing, shortening of the length becomes more time-consuming and therefore expensive. Hand finishing – Hand finishing is very much part of the couture look. Expert hand finishing takes longer and looks very different to a machine finish. B&A alterations aim to keep the original look of your bridal wear, particularly if the dress was hand finished to begin with unless you prefer otherwise. 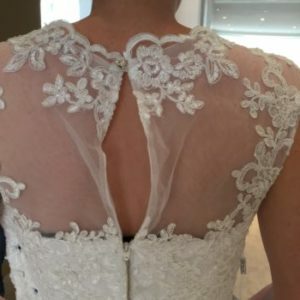 Whilst for wedding dresses a professional alteration makes all the difference to how you feel on your wedding day, a bridesmaid’s alteration can sometimes can be a more bitter-sweet experience. Bridesmaids do not always choose their outfit and it will probably never to be worn again. So contemplating expensive alterations is often a difficult balancing act of ‘looking good’ versus cost. Even a bridesmaid’s dress is a fraction of the cost of a wedding dress, it can often take just as much time to alter if it is bought ‘off the peg’ or without much account taken of size and fit. We at B&A provide you with an overview and break down of costs for suggested alterations after your fitting consultation for you to decide which alterations to proceed with. Some of our clients do get in touch before they buy their wedding dress to make sure they have gathered enough information to make the right choice. If you need advice please do get in touch to have an informal conversation with one of our bridal fitting consultants. Richly embellished couture wedding dress – shortening of a dress like this needs to be done from the top. Couture wedding dress with multiple tulle layers to add extra volume.